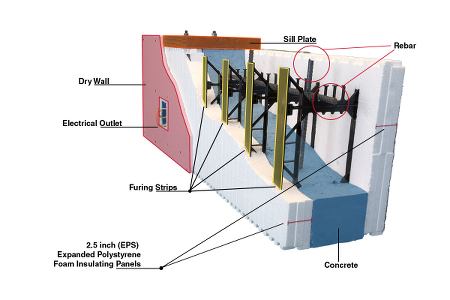 Insulating Concrete Forms (ICF) wall most commonly consist of concrete between polystyrene foam, although other form materials such as polyurethane, recycled wood and cement mixtures exist. The foam is usually two flat pieces of either expanded polystyrene (EPS, average R-value of 3.8 per inch) or extruded polystyrene (XPS, average R-value of 5 per inch). If ties (called webs) are needed to hold the forms together, they are either plastic or metal. The forms, in general, fit together with interlocking tongue and groove joints and stack together accordingly. Some manufacturers use a system of “Lego Blocks” to stack separate blocks on top of each other. The forms themselves come in many shapes and sizes among the different manufacturers. ICF forms have two distinct variables. These are the form size when looking at the exterior of the form and the cavity shape that the concrete fills. The three shapes of ICF form units are panel, plank, and block. These are pictured below. Panel forms are the largest units. These are often 4′ x 8′. Plank units run about 1′ x 8′. They arrive on the job site as separate 2-inch-think planks of foam, and the crews snap them into the wall with plastic crosspieces called ties. Block forms are usually the smallest of the three. A common size is 16″ x 4′. Differences in the interior cavities determine the shape of the poured concrete. The most frequent cavities are flat, grid, and post and beam. See below. Concrete poured in flat cavities has a uniform cross-sectional thickness. Concrete in grid systems has a differing cross-sectional thickness, with vertical columns and horizontal beams formed 12″ to 16″ o.c. The space between the columns and beams may or may not be filled with concrete. Post and beam cavities have vertical columns spaced approximately 48″ o.c., and horizontal beams typically either 4″ or 8″ o.c., without any concrete webbing between the posts and beams. This system has a solid concrete wall of uniform thickness. This system has a nominal concrete thickness of 4, 6, 8, or 10 inches. The actual thickness of the concrete wall is typically nominal thickness reduced by 1/2 inch. Bracing for the forms and steel reinforcing (rebar) for the concrete is as required by the design engineer or the manufacturer’s technical data. This system has a solid concrete wall of varying thickness. It has a nominal concrete thickness of 6 or 8 inches for horizontal and vertical concrete cores. Maximum spacing of vertical cores is 12″ o.c. Maximum spacing of horizontal cores is 16″ o.c. Webs between the cores have a minimum thickness of 2″. Bracing for the forms and steel reinforcing (rebar) for the concrete is as required by the design engineer or the manufacturer’s technical data. This system is often termed “post and beam”. It has a perforated concrete wall of varying thickness. This system has a nominal concrete thickness of 6 or 8 inches for the horizontal and vertical concrete members. Maximum spacing of vertical cores and horizontal cores is 12″ o.c. 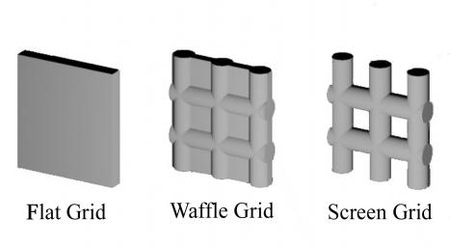 Unlike waffle-grid ICFs, the screen-grid systems do not have webs. Bracing for the forms and steel reinforcing (rebar) for the concrete is as required by the design engineer or the manufacturer’s technical data. From a builder perspective, there are many reasons to consider ICF construction. Costs, availability of labor, and familiarity with construction methods are some of the factors when choosing a framing material. Like conventional wood framing, many ICF homes can be built with a small crew of moderately skilled people. In fact, traditional carpentry contractors may be the most likely subcontractors to have the appropriate tools and skills to install ICF, since an ICF home often has a conventional trussed or rafter type roof, and standard wood or metal interior partitions. Based upon responses from the demonstration home builders, crews become comfortable with ICF construction by the third home. Once this training period is finished, wall forming can be as fast and as straight forward as any wood framing installation. In addition to the reasons builders might consider ICF construction, there are potential benefits for the homebuyer as well. Desirable features for homeowners that are inherently part of an ICF system include less air leakage, acoustical transmission, and durability. Less air leakage into the home creates a noticeable increase in the perception of comfort by the homeowner. These homes provide high thermal values and tight construction as an integral part of the structural wall construction process. The continuously poured concrete walls and tightly fitting forms appear to reduce air infiltration considerably. In addition to advantages of energy efficiency, ICF homes have advantages in structural strength and reduced acoustical transmission. Thicker, heavier walls can reduce the undesirable intrusion of exterior sounds coming into the home. Concrete construction provides a fire resistant, durable structure requiring less maintenance. The homeowners of the demonstration homes reported appreciating the solid look and feel of their homes. The homes also have a “more finished” look than typical framed homes, since ICFs are covered with 1/2″ gypsum board in the attic and, if applicable, the basement.